Are they really "Killer" Whales? At marine parks like Seaworld, Orca whales are part of a huge show, including lights, music, and flips to entertain families. At every show the trainers claim that they have wonderful relationships with the whales when really they don't care for them. Many people think that whales kept in captivity in places such as Seaworld are receiving better care than whales that live freely in their natural environment. The reality could not be farther from the truth. Using Orca whales for entertainment purposes is actually detrimental to their health, can cause them to become aggressive to humans & other whales, and can drastically reduce the Orca's lifespan. So why keep them in captivity? Most people couldn't bear to imagine being taken away from your family, then being put in a bathtub for 20 years, this is what Orca whales go through in captivity. In their natural habitat, Orca whales swim up to 100 miles a day with miles and miles of open water in front of them. If they wanted to swim 100 miles in their tiny pools, they would have to swim the circumference of the pool 1,900 times( PETA-8 reasons). In captivity, Orcas are kept in a small tank no bigger than them. This makes them very stressed out, eventually causing them to become depressed and aggressive to humans and other whales. Due to this stress, and newfound aggression there have been over 140 recorded incidents between Orcas & humans from 1970s-1990s, and multiple tragic deaths. To this day, there have been no reported incidents of Orcas harming humans in the wild(Cowperthwaite). How can someone think this is morally okay?(Cowperthwaite). Although Seaworld has seemed to have to brainwashed many people with the happy music and shows, Seaworld has definitely caused some stress to these poor Orca whales. This change in environment can also change their health. Seaworld's Orcas have a very different trait than Orcas that are in the wild. 30% of Seaworld Orcas have a collapsed dorsal fins, which they claim is something that is very common among Orcas in the wild, but really it is a sign of illness(Cowperthwaite). In the wild less than 1% have collapsed dorsal fins. They can also get something called prison neurosis. This is when they do strange behaviors such as: swimming in circles, establishing pecking orders, and sometimes even lying motionless on the bottom of the pool. They might even chase each other, and in the wild if they were being chased or threatened, they have thousands of miles to swim away. In captivity they don't really have anywhere to go so they will either get hurt by whale, or will hurt themselves on the metal parts of the pool. They might even become overweight due to the food of gelatin/cow & pig bones(PETA- 8 Reasons). 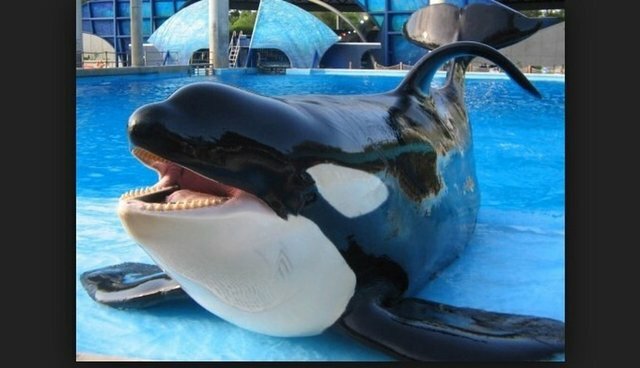 Tilikum is 12,000 pounds & he eats 83 pounds of gelatin a day. This is not very healthy for the whales & may cause they to be not very mobile. Seaworld has done a lot of damage to the Orca whales without the public noticing. What else haven't they told us? The average healthy human lives about 75+ years, now take that healthy person as a baby away from their family and put them in awful living conditions. This is one of the many reasons Orca whales that live in Seaworld have shorter lifespans. Seaworld claims that Orcas in the wild live to mid 30's if that, and say that they actually live longer in Seaworld due to the veterinary care(Cowperthwaite). This seems logical right? Well it's in fact false. There is in fact and Orca in the wild that has lived to be 103 years of age and has evidently showed us that Orca's in the wild have the potential to live as long as humans(Granny). Most people hearing this information then begin to question Seaworld, as they should. Orcas at Seaworld have premature deaths, usually only living to the age of 9.The oldest Orca in captivity is around 50 years old. Orcas at Seaworld rarely make it even to the age of their cousins in the wild (PETA- 8 Reasons). Although they have the veterinary care, and clearly enough attention from humans, they deserve to be in the wild where they belong. Most people believe that animals in Marine parks like Seaworld are receiving the best care possible, which in some ways is true, but they truly belong in the wild. Being in captivity does some severe damage to them physically & mentally(Cowperthwaite). In the wild they have space & family, while in captivity they are kept in close proximity and aren't related to the other whales like Seaworld claims. Due to the fact that they get food, attention, and health care, you would think that they would be happy, but they get very stressed and depressed. Although Seaworld has done very good things for the hales, they have done too much damage, that cannot be fixed. Is it ok that these whales suffer? Should trainers have to worry everyday they go to work that this might be their last day? Should mother whales be worried that they might lose their babies? No, none of this would be a problem if we put an end to it. Do you want little kids to grow up thinking these beautiful majestic animals belong in concrete tanks? Should all of this nonsense go uninterrupted, put an end to the suffering. Don't go to Seaworld, and spread the word! Works Cited Bardroff, Jenna, ed. "10 Signs Whales and Dolphins DO NOT Belong in Tanks!" One Green Planet. N.p., 1 Oct. 2014. Web. 16 Mar. 2015. . insanity Blackfish. Dir. Gabriela Cowperthwaite. Dogwoof Films, 2013. Film. DOcumentary "8 Reasons Orcas Don't Belong at Seaworld." Seaworld of Hurt. PETA, 2015. Web. 9 Mar. 2015. .